It’s that time of year again. 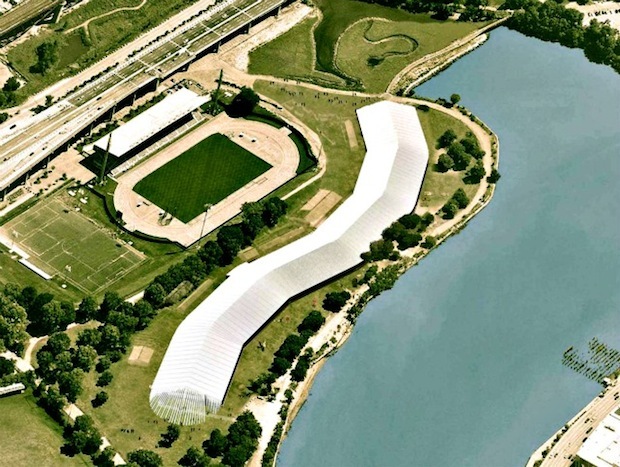 The great white spaceship of an art fair, Frieze NY, prepares for its descent on Randall’s Island, bringing with it some of the biggest galleries and richest collectors from around the world. 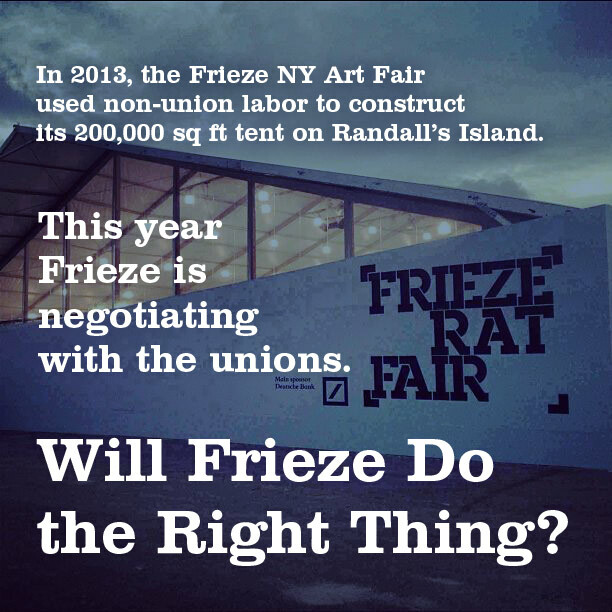 Last year, Arts & Labor launched a campaign in solidarity with Teamsters Joint Council 16, IATSE Local 829, IATSE Local 1 and District Council 9 of Painters to demand that Frieze hire union and local labor in the construction of its tent. We continue to organize as a coalition around these demands. 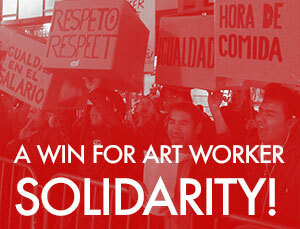 In 2014, Arts & Labor will continue to advocate for union jobs and against exploitative conditions for all art workers at the fair. 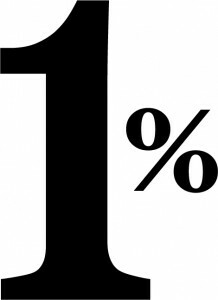 Arts & Labor also demands that Frieze NY, a multimillion dollar operation held in a public park, support the surrounding neighborhood-based arts communities. 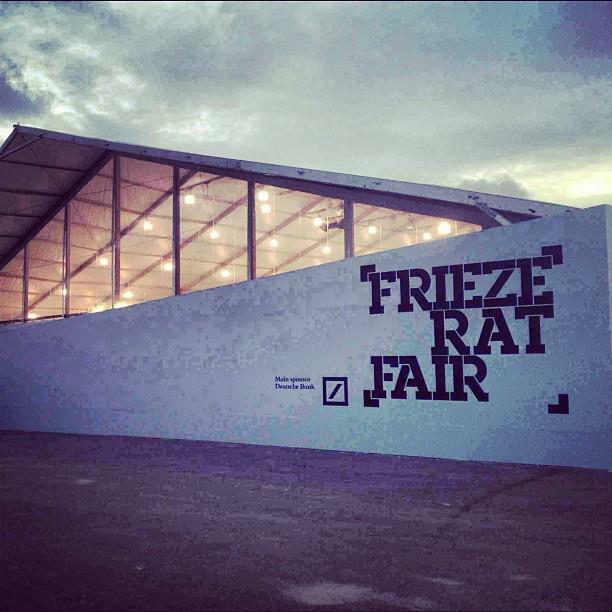 • Last year Frieze hired the company Production Glue to construct its massive tent. Production Glue refused to hire local and union, and instead brought in workers from as far away as Wisconsin, paying them a fraction of the wages that NYC workers receive. 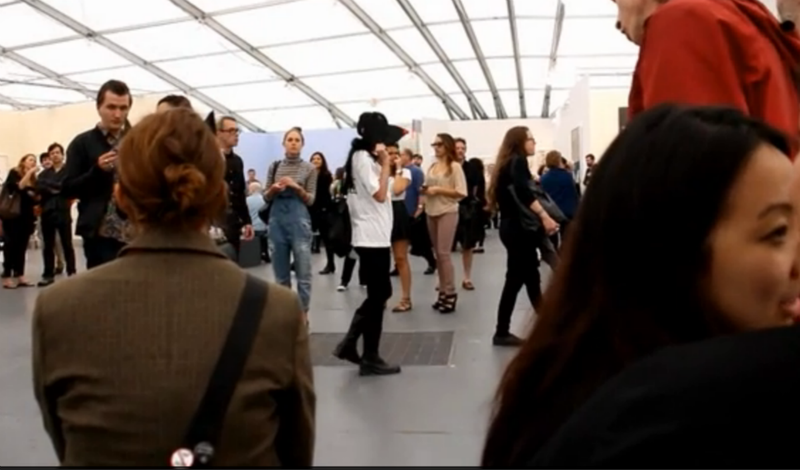 • Frieze is inaccessible for many New Yorkers with its ticket prices of $44/person. 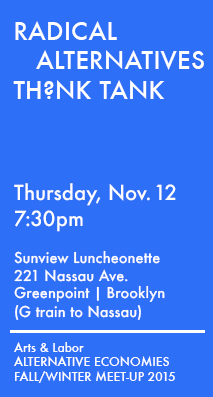 • There is a longstanding fight against privatization and to keep Randall’s Island accessible to the surrounding neighborhoods of East Harlem and the South Bronx. There is a comprehensive of this history on East Harlem Preservation’s website. May 2, 2013: Arts & Labor participates in a public hearing about the Frieze Art Fair in front of city council. 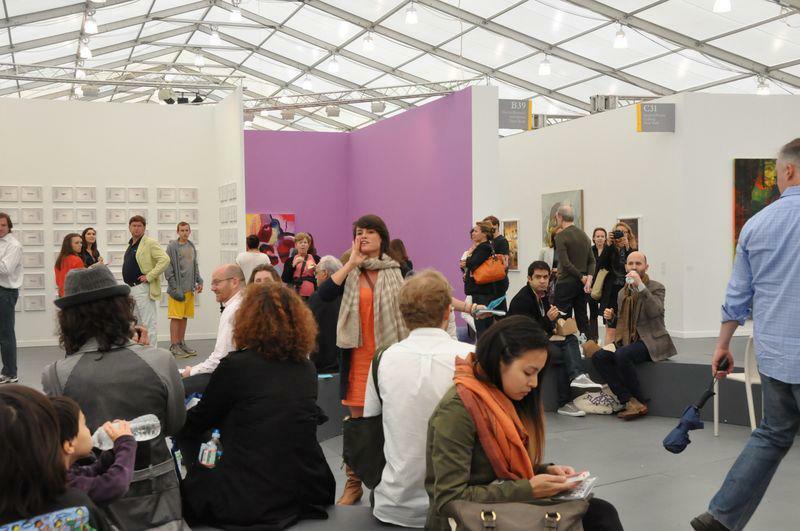 May 6, 2013: Arts & Labor issues a letter to panelists speaking at the Frieze NY Art Fair and to participating artists, galleries and attendees. 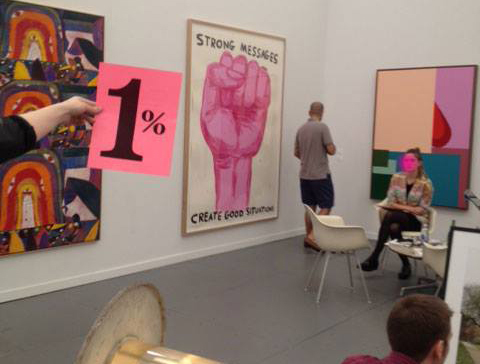 A number of participating artists and members of the public contacted the Frieze organizers to demand fair pay and union jobs at the event. May 10, 2013: Arts & Labor & The Teamsters speak on Suzanne Lacy and Nato Thompson panel. The Teamsters are not allowed to speak at the last minute, and Arts & Labor reads statement for them (view raw footage here and skip to 15:40). Check out the post on the Intern Labor Rights site!